Yesterday was the first day of school around here.....and marked juliens first day of SK. He was so excited to be heading back to see his teachers and his friends! Aw, that is sweet. He looks happy. So sweet. I didn't get any back to school pictures that I can use on my blog :( Mine also started SK and was so excited when the bus came. 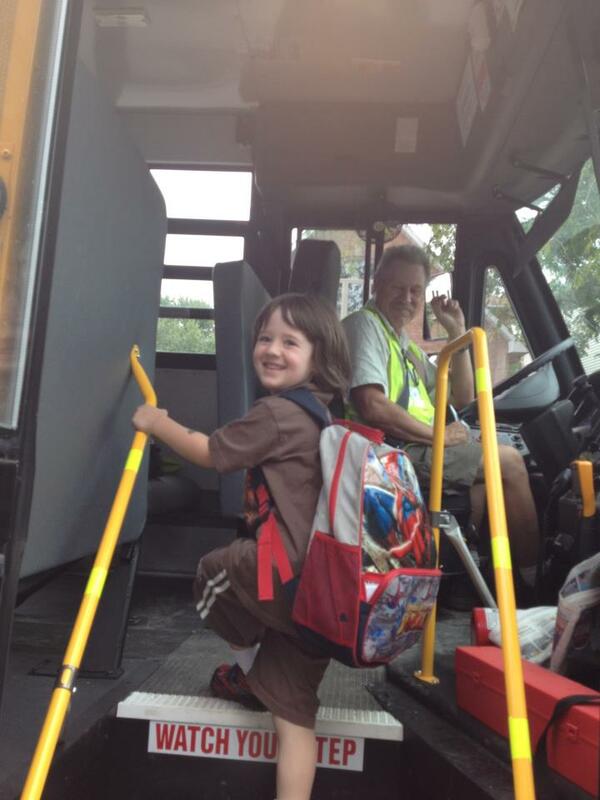 He's so lucky that he gets to experience the school bus! We live too close for buses, so sadly my kids won't get to enjoy it. He looks pretty happy! Sweet! My little guy is heading to JK on the bus for the first time tomorrow. I may need that box of Kleenex supposed to be sent in his back pack! Speaking of which we almost got the same backpack for little guy LoL lovely post, thank you for sharing! He looks so happy to be going to school! Hope he had a great day! Hope he had a great first day. He looks like a joyful little student. Happy looking little guy. Hope his first day back rocked.